Volt is one of the UK’s leading electric bike manufacturers and distributors. Volt bikes are designed and engineered in the UK and have a good reputation for quality and reliability and have developed a range of about 18 ebikes now in 2017. They have catered for most areas of the market, tailoring each model to ensure battery, frame style, tyres, suspension, gears and accessories cater for the needs of those who are likely to buy those ebikes. Volt also offers a full 2-year warranty on all electric bikes and claim that the electric components are maintenance free. So which Volt Electric Bike is most suitable for you? Because of the wide range of Volt ebikes available, we’ve broken them down below into categories, providing a bit of a comparison, with pros and cons of each model so you can easily decide which Volt electric bike is best for you. Volts folding ebikes are some of the best on the market. They are solidly built but are still relatively light, and because of the location of the battery behind the seat post, are well balanced and easy to cycle. The Volt Metro LS is designed more for female ebike riders with a step-through frame and vintage styling with brown leather seats and handlebar covers, and a cream rather than white paint job. Also available in black. Apart from that, the specification is the same as the original Matro above, bar a lower specification battery producing just 40 miles per charge. Volt has a good range of men’s electric bikes including those designed as hybrid models for use on the road and paths, and also mountain ebikes. We voted the Volt Pulse as one of the best Men’s ebikes on the market in our Best Electric Bikes 2017 Awards. The Volt Pulse ranks high in the Men’s Hybrid bike category because it has a very good battery capacity providing 80+ miles from each charge if you buy the more expensive model, and is very good value for money under £1,700. The addition of a throttle-only motor control option is welcome on longer journeys too. 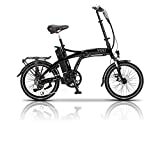 It is also one of the lightest ebikes in this category, often 5kgs lighter than its rivals. As you would expect from the price tag and name the Volt Infinity is Volt’s top of the range model with cutting-edge technology. It features the Shimano STEPS crank drive and hub which are very smooth, quiet and efficient compared to come electric motors on the market. If you expect to take on some steeper climbs and tougher paths then you are better with an electric mountain bike than a hybrid ebike because they offer wider and deeper tyres with more grip, and are designed for uphill and downhill cycling. Volt has two models, starting with the Alpine which is well equipped. At first glance, the Alpine X looks no different from the Alpine above, but it features a Super High Torque motor and has the option of 29″ wheels. It also has higher specification brakes and gear system. The extra torque should give the more avid mountain biker an advantage when heading back to the top of the trail. As well as the folding bikes Volt has also catered for the women’s ebike market with two main models below. The Volt Burlington is a hybrid-style ebike with a step-through frame suitable for women cyclists and men who have trouble stepping over the admittedly high crossbar of a standard men’s bike. Step through frames tend to be heavier than A-frame bikes because the cross frame has to be wider and more sturdy so the Burlington weighs just under 21kg, but this is still very good for an electric bike. Available in cream and pastel blue the Volt Kensington definitely caters for leisure riders who want a vintage style electric bike. 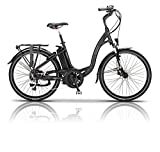 With brown leather seat and handlebars and a metal front basket it does the job very well but is packed with the same technology featured on all other Volt electric bikes. It is slightly lighter than the Burlington and slightly cheaper too.